From a former death camp in the snowy Russian mountains of 1973, Jez Kord is sent into the freezing wastelands to prove himself fit. Returning to camp, the sky is filled with helicopter gunships and he watches a venomous assault end with the flaming liquid of napalm bombs swallowing up the entire complex. He makes a run for it, but a unit of Spetsnaz elitists are hot on his heels. Jez’s wife Anna is on assignment in Turkey. Adam Mannesh and his twisted band of misfits have designs on a drug empire that Anna has been tasked to take down. Adam comes to her assistance, but betrays her. Now the only chance of survival hangs on Jez evading the Siberian pursuit. The Man in the Blue Fez is the third book in the series of explosive Birth of an Assassin thrillers. If you enjoy suspense thrillers with complex characters and an endless flow of death defying situations, then you’ll love being drawn into these classic tales of betrayal and intrigue from Rik Stone. 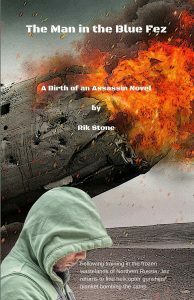 'The Man in the Blue Fez' is the third book in the 'Birth of an Assassin' series and while it is stand-alone, it draws the characters from the first two books together. My inspiration for the series came when I created a protagonist, but was without a story to fit him in. Having non-blood relatives who escaped the Pale of Settlement in Russia, i was inspired by the stories that came with them. The period they had left, 19th century, wasn't suitable for what I had in mind for my hero, so I moved on through history until coming to post-war Soviet Russia. I think in the main my characters came knocking rather than me going looking. Like a traveling show, they seemed to join the ranks as each story matured. Noon, the sun had begun its descent towards the western horizon and the promise of warmth was sinking with it. Gold and pink rays glancing off mountaintops spread as one over the frozen lake below. Midway up a mountain slope overlooking the lake and not too far from where the Urals trailed off into the wasteland, Pavel Rostislav lay in wait. A light wind whispered across the incline, bringing cold that found a way through his winter gear and set him shivering. He snuggled into the hollow cut from the compacted snow as far as he dared, but knew there could be no respite. He had to hold his vigil. With teeth gritted, he raised the standard issue field glasses to his eyes and scoped the fishing hole in the ice lake while trying to ignore the freezing barbs that spiked at his bones. Time pressed on and he took a moment of it to glance at the thermometer on the backpack by his side, shuddered to see the temperature had dropped to minus fifty. Mist clouds would be visible to an enemy, so he expelled his breath against the chinstrap on his snowsuit, but then small ice crystals bunched up there and he exhaled in exasperation, irritation nipping at his spirit. The sun dropped below the peaks and the ice lake turned bluish grey while the sky on the eastern horizon reflected mauve tiers on snow-knuckled mountains. Snow flurries lifted from drifts nearby and snaked down into the basin, dancing like ashes blown from a dead fire. Pavel’s goggles took the color down a notch further and his heart sank. All he wanted now was to get this thing done and return to camp. However, just as he began feeling that his blood might turn to an icy sludge or his body may be only moments away from paralysis, a blur on the landscape took human shape and his spirits lifted. Shrouded in a heavy arctic snowsuit, the man moved slowly yet gracefully towards the fishing pole sticking up from the ice. The garment he wore should have been brilliant white, but it had turned a dull bluish grey – same as everything else. He wore traditional Siberian snowshoes – same as Pavel’s – large teardrop-shaped hardwood frames with rawhide lacing crisscrossed into a strong latticework. Not a big man and because of that, and his deftness, he hardly left a print as the meter-long constructs dabbed and glided gently over the snow. Any imprints he might have made were swiftly covered as clouds of blue flakes curled around his ankles and stole all signs of his presence. After clearing newly formed ice from the fishing hole, he pulled on the cord attached to the pole and hauled in his catch. Four fish, equally spaced along the line, flapped on the ice. He cut the smallest free and cast it back into the water. Pavel felt that old excitement bubble up and adrenalin ran hot around his gut. His patience had endured long enough. It was time to end the task. His gloves fumbled as he unzipped the leather sleeve and took out the Dragunov sniper rifle within. The deep scar next to his left eye itched as it always did when the thrill of the chase got the better of him. He ran a finger along the crevice to ease the irritation and then tucked the hollow stock of the gun into the softer flesh under his shoulder. Resting his face on the gun’s cheek pad, he slipped his gloved finger inside the Arctic trigger guard, scoped the target through the range finder and smiled. This was all so easy. Almost too easy; for a rifle like the Dragunov, six hundred meters was an effortless distance. The crosshair settled on an elbow and he slowly panned the weapon until his aim was centered where the man’s temple would be. “Bang, you’re dead,” he whispered, and gently squeezed the trigger.